AAEN Performance Parts has bee making high quality racing pipes and silencers for ATV's and Snowmobiles for over 25 years. Mud, Dirt and the Soggy Bogs of the ATV world are the proving grounds for Olav Aaen. 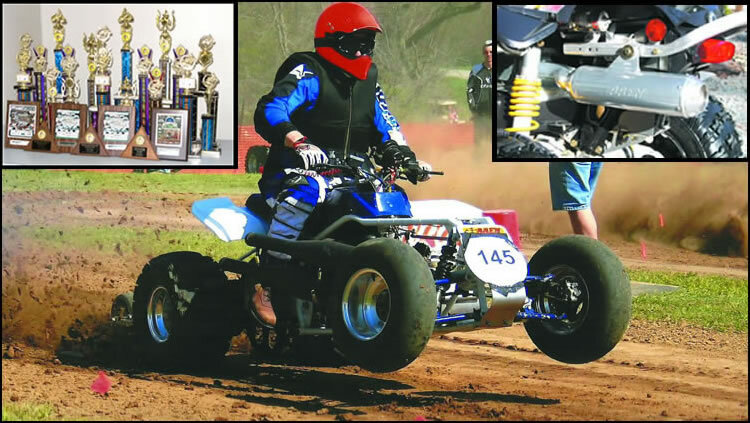 He and his team have been engineering a faster way to getting from one end to the other by developing expert carb tuning, clutch tuning and mastering the art of power pipe and silencer constructions. Check out the overstock pipes on our new sale list today! BLOWOUT SALE ON SNOWMOBILE PIPES! MARKDOWN ITEMS -- BLOWOUT OVERSTOCK, DAMAGED, OR USED ITEMS, ATV SILENCERS AND MEGAPHONE MUFFLERS! Polaris Sportsman 850 and 550 "Stealth Silencer"
The new Polaris Sportsman 850 and 550 Silencer from Aaen Performance is of a new "Stealth Design", that looks much like the stock units on the outside. On the inside, the silencer design is of a freer flow design, unlocking 5 HP and 5 lb-ft of torque through the power band. CAN-AM OUTLANDER AND RENEGADE 800 MEGA POWER SILENCER: The CAN-AM outlander and Renegade 800 Mega Power Slip-On has a 3 stage stepped silver ceramic coated mid pipe and a 4� aluminum body with a large 2.5� core that keeps the sound level at 94 db(A) and is of a closed end design that will pass as a spark arrestor in most states. Race Proven: Jimmy "The Greek" Anagnoustopolous, Dyno man and racer takes home 3 First place Trophies on the SCRAMBLER 500. Check out our 5 Levels of performance capabilities. Maximize your PREDATOR performance with our new line up of Predator Products and Services designed to meet your high performance needs. New Improved: BILLET END CAP REBUILDABLE MUFFLER! We have redesigned our popular Megaphone Muffler to allow quick and convenient rebuilding of the silencer packing. BLOWOUT WAREHOUSE SALE! MARKDOWN ITEMS -- ATV blowout Pipes, Silencers, Accessories! You may need the Adobe Reader to view the sales items. Race engineers and technicians with over 100 years of combined product development experience guarantee you championship winning performance kits tested against the toughest competition. We design, develop and manufacture our own high performance exhaust systems for Polaris ATV's and Polaris, Yamaha, Arctic Cat and Ski-Doo snowmobiles. Our engine packages include cylinder porting, big bore kits, billet heads and TMX flatslide carb kits up to 44 mm. Clutch kits are in constant development to make sure you get the maximum acceleration and top end performance from our power products. Experience the exciting world of high performance with hard hitting trail torquer kit or an all out racing engine!